Two sisters are devoting their summer holidays to helping sick children about to undergo medical procedures at Hull Women and Children’s Hospital. Amiee Hilton, 11, and her sister Millie, 10, are selling sweets at Hull Royal Infirmary and Castle Hill Hospital to raise £500 for Acorn Ward. The sisters will use the money to buy a virtual reality headset to distract youngsters on the children’s ward who are about to undergo medical procedures as part of their treatment. The girls’ mum Sally is a Health Care Assistant on Acorn Ward and, together with Clinical Support Worker Emma Chaffer, is supporting the girls in their Lifestyle Project run by Humberside Police. She said friends and family have donated money so the girls can buy boxes of sweets to make up into 1,000 bags to sell to staff and visitors to reach their target. Sally said: “It can be hard for children coming into hospital who feel a little bit anxious about their treatment and this headset can be used to distract them and give them something fun and exciting to look at while they’re undergoing the procedure. “We’re really grateful to the staff and visitors who have already bought bags of sweets and hope people will support the girls when they head across the Castle Hill. 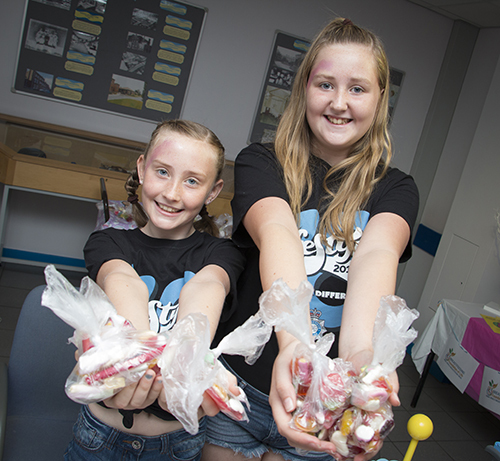 As well as setting up a stall to sell sweets in the reception of Hull Women and Children’s Hospital, the girls are also using their pocket money to buy sweets to give to patients and staff at the Queen’s Centre at Castle Hill Hospital.